Discover a warm, inviting environment for newborns and infants. 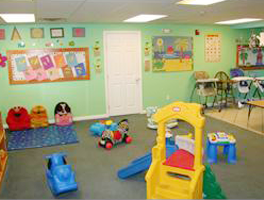 Our infant room was built to provide a safe yet stimulating environment for babies. Help your little one thrive with our individualized toddler care program. 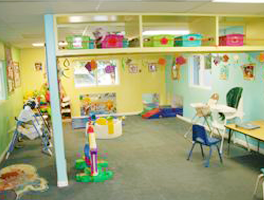 In our toddler room, children are able to explore their space and develop new skills. Take the next step towards academic excellence when you choose our preschool. We help students develop socially, emotionally, and intellectually. Learn more about our wide variety of exciting activities. From playdough fun to gardening, we offer an array of activities aimed at helping children learn. 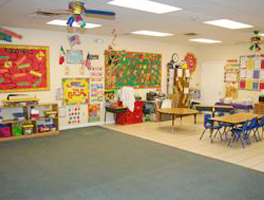 The Rainbow Early Learning Center has been in business since 1987. We believe every child is different and unique and deserves a learning program as unique as each child is. The Rainbow Early Learning Center is designed to promote and encourage learning through hands-on experiences. Open to all ages 6 weeks to 5 years, our beautiful center offers a loving and holistic style of early childhood education. 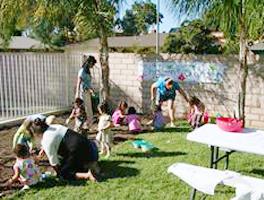 The Rainbow Early Learning Center is committed to excellence in Early Childhood Education. Our purpose is to give children opportunities to learn and develop to their fullest potential in a safe, nurturing environment. We strive to promote success for each individual child to grow in dignity and self-esteem by providing an atmosphere of support and caring. The skills that children learn at an early age are tools they will use as they continue in their educational programs. As qualified professionals, the staff of The Rainbow Early Learning Center is committed to providing an individualized developmental and academic readiness program. Each child's interest and strengths are considered a vital asset to a balanced program.